When we last saw Elizabeth Bennet and Mr. Darcy, in Jane Austen’s “Pride and Prejudice,” they had gotten past the tempestuous early parts of their relationship, ultimately realizing that they were perfectly matched, totally in love, and ready to tie the knot. Now it’s two years later, 1815, and they’re still blissfully — and quite co-equally — wed, and happily ensconced in Darcy’s grand estate, Pemberley. The Bennet family begins to arrive for Christmas: even-tempered and very pregnant Jane (cheerful, centered Amara Young), who’s married to Darcy’s good friend, the genial Bingley (affable Sittichai Chaiyahatt); giggly, gossipy Lydia (amusingly excellent McKenna Foote) is miserably espoused to the always-absent and inattentive Charles Wickham; and bookish, pedantic Mary (marvelous Nadia Guevara), who remains single, is still spouting facts and practicing fiercely on the pianoforte. She’s given up the idea of meeting any man who could ever understand her. And then, young Lord Arthur DeBourg (Carter Piggee, compellingly nerdy), who’s just inherited a vast estate, arrives for a holiday visit. He turns out to be as book- and fact-obsessed as Mary. “Miss Bennet: Christmas at Pemberley” is the 2016 sequel to Austen’s beloved 1813 romantic novel, which centered on Elizabeth’s evolution into maturity and self-awareness. In the new piece, by Lauren Gunderson (the most produced playwright in the U.S. last year) and her co-writer, frequent shepherdess and developer of new plays, Margot Melcon, the focus is primarily on Mary, with a bit of growth emerging in immature, self-absorbed Lydia. The middle Bennet sister, Mary, is often ignored or left out, but now, at last, she takes center stage. We watch the vicissitudes of her budding relationship with de Bourgh. Both are shy, except when it comes to asserting what’s true and what’s right. Despite their obvious intelligence and relentless curiosity, both are hopelessly inadequate in the social mores of romance. There are a few hiccups along the way to their union, particularly mistaken mash-notes and a potential rival, but it all turns out well in the end. This charming concoction captures both the sense and sensibility of Austen, with all the formality, irony, class consciousness and nascent feminism of her novels. In this obviously loving family, only flighty, flirty Lydia is a wily schemer, mostly, she admits, as a diversion because she’s so unhappy. The others are full of good humor and good intentions, and everyone works hard to bring the naive couple together. 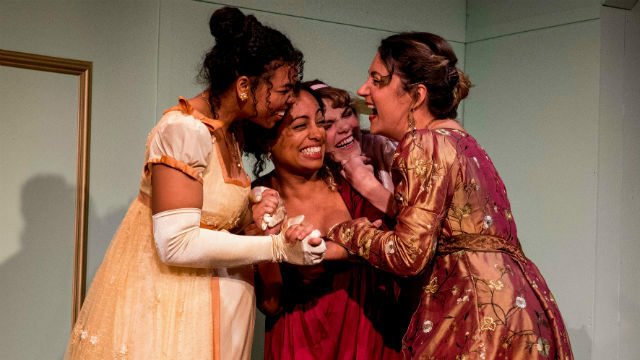 New Village Arts is presenting the local premiere of this comedy of manners, and their production is sheer delight. The action takes place in the estate’s cozy, well-appointed drawing room and library (handsomely designed by Kristianne Kurner), with lovely costumes (Elisa Benzoni), and effective lighting (Becky Goodman) and sound (Melanie Chen Cole, with “some piano” by Nina Gilbert). Violins trill romantic versions of Christmas carols in the interludes, and as Guevara’s Mary really seems to be playing a mean pianoforte, apparently giving Beethoven a good working-over. Guevara is adorable and delectable as stern, serious Mary, though even bespectacled, it’s hard to see her as the plainest of the Bennet sisters. Elizabeth is the smart, sensible one, and her devoted husband, Mr. Darcy (wonderfully credible Timothy L. Cabal) is rock-solid, helpful and thoroughly likable. Then, into this pleasantly harmonious assemblage storms snobbish, bossy and condescending Anne de Bourgh, who knows what she wants and intends to get it. Michelle Marie Trester plays her to a supercilious, scowling T.
It’s great fun to spend the holidays with the Bennets et al. And revelatory that forward-thinking Elizabeth is breaking new ground by having a Christmas tree, German-style, in the house. It’s a never-ending source of wonder, surprise and even dismay to the extended family. For her 99th show at New Village Arts, co-founder/artistic director Kristianne Kurner has chosen an appealing, engaging play and directed it crisply, sensitively and amusingly. (Gerilyn Brault did a great job as dialect coach). This may become a welcome new Christmas tradition: nostalgic and sweet, without being treacly, bringing (just when we need it most) a little more joy to the world. Performances are Thursday at 7:30 p.m., Friday and Saturday at 8 p.m., with matinees Saturday at 3 p.m. and Sunday at 2 p.m.